April is National Car Care month! If you haven’t gotten a jump start on the season, this is a great time to get moving on preventive maintenance. This checklist can help you be sure that your car gets the attention it deserves this spring. 1. Proper wheels & tires keep you safe. Make sure that they have proper tread, are in alignment and that wheel components are in good shape. Changes in weather can alter your tire pressure so make sure it’s where it should be for spring. 2. The A/C is more than just cool air. The compressor, evaporator and A/C unit work to keep your windows clear as well as the temperature comfortable in the heat. 3. Over the winter, your brakes can endure a lot of damage. Make sure to get your brake linings, rotors and drums inspected at every oil change. 4. Make sure you check all fluids in your vehicle, including engine oil, brake, transmission and power steering fluid, windshield washer fluid and coolant. It’s easy to overlook one or more by accident. 5. The steering & suspension system should be inspected annually, checking for leaks, damage or loose mounting hardware. 6. Did you know that regular tune-ups and maintenance will help you burn less gasoline, can prevent inconvenient repairs and decrease your carbon footprint? Make sure to keep a schedule or when you need to bring your vehicle in for factory scheduled maintenance. 7. Your exhaust system carries unsafe exhaust gas away from the engine and out of the vehicle, keeping you safe from harmful pollutants. Make sure to have your vehicle checked regularly or if you think there is an issue. 8. Inspect your battery regularly to make sure it’s clean; connections are tight and corrosion-free. 9. The lights in your vehicle require replacement every so often. Some factors that impact the need for replacement include frequency of use, weather and equipment. 10. Replacing belts & hoses at intervals recommended by your vehicle’s manufacturer can prevent breakdowns, engine damage and more. Need help getting your vehicle ready for the road this Spring? Click here to schedule an appointment online. 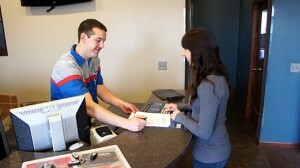 Don’t forget to visit our coupon page for a discount on our Spring Car Car Check-Up service!